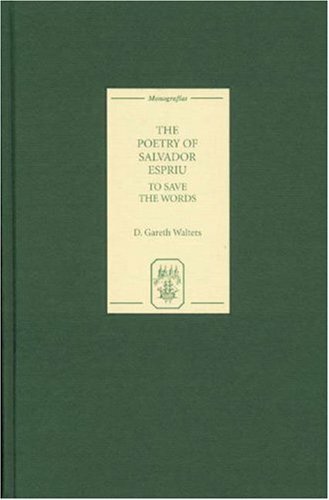 Two standpoints govern the approach taken to the poetry of Salvador Espriu [1913-85] in this first extended study of his work in English. First, the author explores the structural implications of symmetry and numerology, in a chronological rather than thematic survey of the poetry - a procedure that involves a consideration of how each book [what could be termed in most cases a macro-poem] attains its distinctive character while having common preoccupations and stylistic traits. Secondly, he examines the tension implicit in Espriu's poetry between involvement and detachment or between the civic and the lyric. One issue addressed is why Espriu is perceived both as the symbol of moral resistance against Francoism and as a hermetic, 'difficult' poet. Central to the study is an awareness of the precarious status of the Catalan language in the period when Espriu wrote most of his poetry, and of how his work represents, by dint of its linguistic character, an act of defiance and affirmation, in Delor's view, a 'metalinguistic literature'.<br /><br /> D. GARETH WALTERS is Professor of Hispanic Studies at the University of Swansea.